44,400 people every day: this is the number of children, women and men who in 2017, have been forcibly displaced from their homes worldwide. 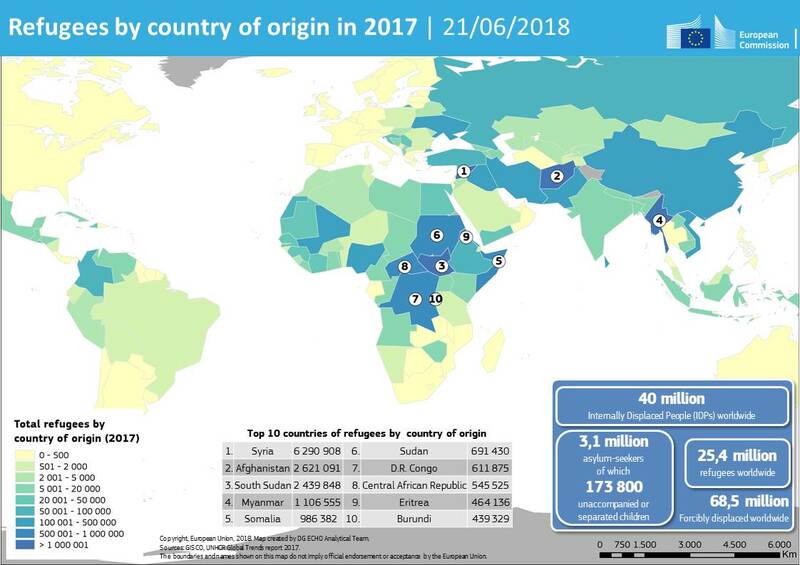 This is one of the data of the UNHCR Report about Global trends (here you can find and download the entire document: Doc1 and Doc2 ). Among these people, among these 65.6 million people forced to leave their countries, around 22.5 million are refugees. First of all, it’s necessary to remember that not all the migrants are refugees: they are a particular category of immigrants who has been recognized a special legal status (See the Article 1 of the 1951 Geneva Convention here: http://www.unhcr.org/3b66c2aa10). Europe, totally, hosts 5.2 million refugees. From 10.4 million at the end of 2011, the number of refugees has increased steadily to 16.1 million by the end of 2015. At the end of 2017, the global refugee population, including 5.4 million Palestine refugees, was 25.4 million. 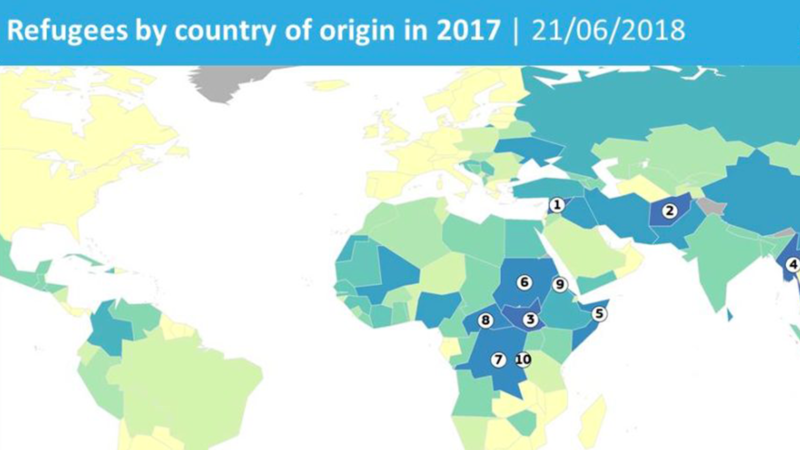 More than two-thirds, about 68 per cent, of all refugees worldwide came from just five countries: Syria, which remained the largest source country of refugees, Afghanistan, South Sudan, Myanmar, Somalia. Developing regions (so, not Europe…) hosted 85 per cent of the world’s refugees: about 16.9 million people. The least developed countries (again, not the most developed and rich countries) provided asylum to one-third of the global total (6.7 million refugees). By the end of 2017, about 3.1 million people were awaiting a decision on their application for asylum, about half in developing regions. Last but not least, speaking about the phenomen all over the world, half of the refugee population in 2017 are children below 18 years of age. Germany in 2017 has granted refugee status to 325,370 people, followed by France, and Italy, with 35,130. In Europe the country with more refugees per thousand inhabitants is Sweden with 23.4 refugees – it has the highest refugee / population ratio, 2.3% -, followed by Malta with 18.3 refugees every 1000 inhabitants. Italy is eleventh with 2.4 refugees per thousand inhabitants. The European state with most immigrants (so not only refugees) is Spain, where immigrants are 10 per cent of the population, followed by Germany.